1 year study and training course with built-in career option! Snipers are some of the most highly trained soldiers, so-called "force multipliers". They are not only expert marksmen, which indeed they are. Snipers must be able to direct precision fire against targets at distances up to 1000 yards or more. Thus, they must of course be highly trained in the use of precision weapons and other specialized equipment. Snipers work in small unit, usually one sniper and one scout/spotter who also doubles as security for the sniper. Shooting, however, is only part of the package... a sniper team is a very important asset for any law enforcement, counter terror, SWAT and military unit. The sniper provides intelligence by surveillance and observation as well as important back-up for assault teams. 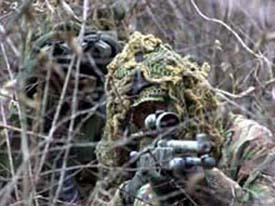 Sniper teams must be able to approach undetected, stay and retreat without detection, they must stay in position for sometimes several days or longer and they must be able to operate alone, behind enemy lines and live off the land, if need be. Course tuition fee: incl. the complete study part and seminars, tuition fee is 20,000.00 USD incl. accommodations, meals and full training, use of equipment and certification – the fee can be paid up in 4 equal instalments. The course comprises 12 weeks in-camp training which can be divided into up to 3 or 4 parts of 2 to 6 weeks. Training on range comprises shooting several hundreds of round on various weapons each. This course comprises about 9 months of studies (theory, elearning) incl. practical exercises, and 12 weeks in-camp seminars with hands-on training with weapons and equipment and other important training such as intelligence operations and much more. This is a unique course, probably the only one of its kind available on the private market. Our graduates are select and elite security experts with rare skills sets. 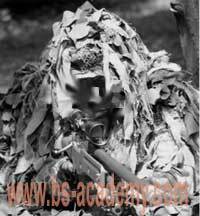 Thus BSA Sniper Course provides for the complete scout/sniper training including modern equipment such as ballistic computers as well as the complete and comprehensive studies needed for this complex profession. Our security agency offers a guaranteed employment for each graduate of this course. We accept only a certain number of participants into this course, which equals the number of experts we will employ ourselves! Thus: a built-in career guarantee (see also www.eubsa.com/ERT). BSA Sniper instructors are ex-Marine sniper, Israeli sniper, and tireur d'elite of the French Foreign Legion and other elite snipers from various countries. Prior experience with rifles will be a plus but this course can turn beginners into expert snipers, so anyone can sign up who qualifies for this course.